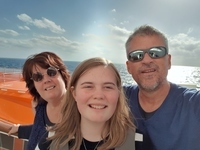 My partner and I, along with our 14 yo daughter (New Zealanders) recently spent a month (Dec 2018) in Europe including two cruises, one on the Costa Luminosa (out of Venice) and the other on the MSC Meraviglia (out of Rome). The following are my thoughts on comparing the two: Foremost I would like to say that we had a fantastic time on both cruises and staging a cruise for 2-5 thousand people is obviously a mammoth undertaking requiring staggering resources and organization. People come to cruises with very high expectations and it is always possible to set your expectations in the realm of fantasy, such that they will never be met. On the Luminosa we booked a suite, which included a comprehensive drinks package, and on the Meraviglia we booked a balcony cabin and bought the comprehensive (but not premium brands) drinks package. 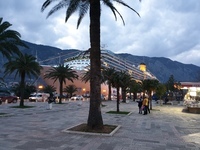 The total cost of both cruises (excluding excursions) came to within a few hundred dollars of each other (US$2,830+/-). OVERALL On balance we enjoyed both cruises. 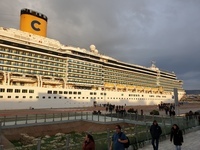 I preferred the Costa cruise because I really did not like the crowds on the Meraviglia. There were just too many people making too much noise with too many children for my liking on holiday. To be fair though, I&apos;m an introvert, I have seven children, and a holiday to me means getting away from people and children, at least a bit. On that score the suite package on the Luminosa allowed us to eat in a proper restaurant with peace and space for every meal. The other thing I liked was that the suite cabin was twice (I do mean twice) the size of the balcony cabin on the Meraviglia. Dining on Meraviglia was by contrast the noisy chaos that is buffet dining (better than the buffet on the Luminosa but fundamentally the same experience) or dining in the dedicated dinner and breakfast restaurants, which are also noisy busy affairs with the tables of other diners being mere inches away from yours. While the food in the Meraviglia buffet was better, the restaurant food was just as hit or miss as the Club Luminosa. 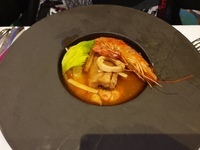 I had delicious food on both cruises and some terrible dishes. I thought Costa unfairly got a bad rap on this score in hindsight, although it is fair to say the Club Restaurant food is not the same level as a surcharge specialty restaurant on another line, it more than made up for this by being included in the price, a comfortable setting, and available on demand when we needed for any of the three meals a day (i.e. not set dining times). One of my frustrations with Costa is that the wording around booking a suite is ambiguous about including dining in the Club Restaurant for all meals. I thought this was the case and I found it to be the case once on the cruise, but I could not get a Costa agent, or Costa, to confirm that was the deal prior to the cruise. In fact I was erroneously told on a number of occasions by the Asia agent that Club Luminosa dining was NOT included. While I&apos;m on gripes, priority embarkation with Costa was not a pleasant experience and did not feel "priority". I put this down to a majority non-English speaking crowd and therefore insufficient signs in English and the fact that much of the embarkation is managed by port security staff, who have no interest or training in prioritizing passengers who may have been promised the privilege. Other than that the Costa cruise was managed as expected and I have no gripes. The staff on both cruises were friendly and helpful, and fantastic for the most part. Gripes on Meraviglia were more numerous. Embarkation was smoother, which I put down to a bigger and better equipped port. I soon found out through additional charges on my account that MSC had changed the method of charging for drinks packages since I had paid for mine in advance, so I was now on an "old" package, which the bar staff may or may not be trained on and for which all identification of included and excluded drinks had been removed from all the drinks menus. Fun! Also the MSC website stopped recognizing our booking a month before the cruise, which was annoying; and the three specialty restaurant and show bookings all had to be redone (no big deal). MSC has an annoying habit of giving you things to do to avoid charges like delivering photos back to the room steward, who was seldom seen. Our room was not made up on two days and was only turned down for the night on one night. Costa only charged a half the gratuity rate for the third child passenger, whereas MSC charged the full perdeim rate. CABINS As I said the Luminosa suite cabin was literally twice the size of the balcony cabin on the Meragivilia, so there is no competition there. Having the personal butler was also superior, to having a room steward who did not turn up on two days because he was assigned to 1) cleaning the balconies; and 2) crew safety drills. On the plus side we booked cabin 8205 which sits just above the lifecraft and has a balcony 2.5 times the size of the other balcony cabins. We enjoyed the extra space there. DINING I have covered above. The specialty restaurants on the Meravilia were all a bit hit and miss. Butcher&apos;s Cut was very good, but sitting in the Galleria walkway is not good if you don&apos;t want people standing next to your table and yelling to their friends on the deck below. The Sushi was very high quality but light in quantity and the desert was not available. The Eataly was better than the reviews suggest, with SOME of the dishes being very good, but that was again let down by the deserts being very ordinary. On average the food was better on the Meraviglia, but the dining experience was better on the Luminosa because of the full time use of the Club Luminosa. ENTERTAINMENT AND ACTIVITIES Activities on the Meraviglia surpassed those on the Luminosa although we enjoyed our included spa day on the Luminosa very much. The Meraviglia is a bigger ship and just has slightly more on offer, more bars, galleria, and water slides. We found the shows to be quite even on balance. The Luminosa shows were very good. The entertainers around the ship were somewhat limited. We enjoyed playing a game where we would work out what lyrics the singers were actually singing when they sang English songs. What they actually sang guessing at the English and pronunciation was actually quite hilarious. Trivial Pursuit had a dimension added to it when presented by someone who clearly did not know how to translate questions into English. "What color does a bride in China wear?" became "What color is the bridge in cheena?" We did not do well. On the Meraviglia three of the four shows we went to appeared to be lip-synced. Now I stand to be corrected, but it appeared to us that in all but the show including the band the singers lip-synced their way through the entire show. The dancers on the Luminosa were less ballet trained but worked as a troupe much better. The Circ-de-sole show was excellent on the Meraviglia so the shows came out even for me. SERVICE Staff and service was excellent on both cruises. Staff were always friendly, pleasant and eager to help when help was asked. We did not run into attitude or passing the buck on either ship. The staff were great. PORTS and SHORE EXCURSIONS We only did one excursion in the two cruises and might well have avoided that with what we know in hindsight. 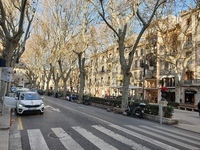 Most excursions can be duplicated with a significant cost savings with a little self planning. Ports really depend on the individual and where you want to go. You should want to go to Venice though. 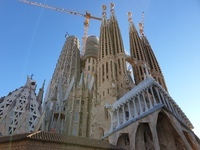 :-) Only one comment on excursions: none of the excursions offered on Meraviglia would take you inside La Sagrada Familia in Barcelona. This is a crime. You should not go to Barcelona and not go inside this unique and stunningly beautiful building. The outside is impressive, but the inside is a moving experience. FELLOW PASSENGERS Both cruise were far and away dominated by Italians, which didn&apos;t bother me at all. Introvert. I was surprised at the lack of Americans or Brits on the Meraviglia. I would put the population of Americans at about 1% and Brits slightly higher. If you want to meet people and make friends, this could be a negative. Good on the Italians for holidaying with their children. They don&apos;t have sitters on the ship, so the kids get an early education on how Mommy and Daddy go out and have fun at night (including in the Casino). LOL [shakes head] CONCLUSION Costa Luminosa won me over as the best value for money. The big Meraviglia was just too crowed and noisy for me. The public spaces were always filled with the din of loud conversation and no matter what time of night it always seemed from the cabin someone was slamming a door somewhere or children were running up and down the halls. My advice is, give Costa another look, but book the suite or better. I didn&apos;t book the MSC Yacht Club experience, but I have read that children rule the roost there as well, so that might not be your best solution and is pricey. Good luck everyone and I hope you have a great next cruise. Foremost I would like to say that we had a fantastic time on both cruises and staging a cruise for 2-5 thousand people is obviously a mammoth undertaking requiring staggering resources and organization. People come to cruises with very high expectations and it is always possible to set your expectations in the realm of fantasy, such that they will never be met. On the Luminosa we booked a suite, which included a comprehensive drinks package, and on the Meraviglia we booked a balcony cabin and bought the comprehensive (but not premium brands) drinks package. 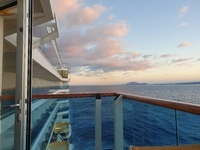 The total cost of both cruises (excluding excursions) came to within a few hundred dollars of each other (US$2,830+/-). On balance we enjoyed both cruises. I preferred the Costa cruise because I really did not like the crowds on the Meraviglia. There were just too many people making too much noise with too many children for my liking on holiday. To be fair though, I&apos;m an introvert, I have seven children, and a holiday to me means getting away from people and children, at least a bit. On that score the suite package on the Luminosa allowed us to eat in a proper restaurant with peace and space for every meal. The other thing I liked was that the suite cabin was twice (I do mean twice) the size of the balcony cabin on the Meraviglia. Dining on Meraviglia was by contrast the noisy chaos that is buffet dining (better than the buffet on the Luminosa but fundamentally the same experience) or dining in the dedicated dinner and breakfast restaurants, which are also noisy busy affairs with the tables of other diners being mere inches away from yours. While the food in the Meraviglia buffet was better, the restaurant food was just as hit or miss as the Club Luminosa. I had delicious food on both cruises and some terrible dishes. I thought Costa unfairly got a bad rap on this score in hindsight, although it is fair to say the Club Restaurant food is not the same level as a surcharge specialty restaurant on another line, it more than made up for this by being included in the price, a comfortable setting, and available on demand when we needed for any of the three meals a day (i.e. not set dining times). One of my frustrations with Costa is that the wording around booking a suite is ambiguous about including dining in the Club Restaurant for all meals. I thought this was the case and I found it to be the case once on the cruise, but I could not get a Costa agent, or Costa, to confirm that was the deal prior to the cruise. In fact I was erroneously told on a number of occasions by the Asia agent that Club Luminosa dining was NOT included. While I&apos;m on gripes, priority embarkation with Costa was not a pleasant experience and did not feel "priority". I put this down to a majority non-English speaking crowd and therefore insufficient signs in English and the fact that much of the embarkation is managed by port security staff, who have no interest or training in prioritizing passengers who may have been promised the privilege. Other than that the Costa cruise was managed as expected and I have no gripes. 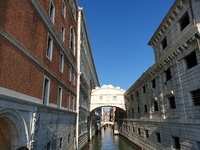 The staff on both cruises were friendly and helpful, and fantastic for the most part. Gripes on Meraviglia were more numerous. Embarkation was smoother, which I put down to a bigger and better equipped port. I soon found out through additional charges on my account that MSC had changed the method of charging for drinks packages since I had paid for mine in advance, so I was now on an "old" package, which the bar staff may or may not be trained on and for which all identification of included and excluded drinks had been removed from all the drinks menus. Fun! Also the MSC website stopped recognizing our booking a month before the cruise, which was annoying; and the three specialty restaurant and show bookings all had to be redone (no big deal). MSC has an annoying habit of giving you things to do to avoid charges like delivering photos back to the room steward, who was seldom seen. Our room was not made up on two days and was only turned down for the night on one night. Costa only charged a half the gratuity rate for the third child passenger, whereas MSC charged the full perdeim rate. As I said the Luminosa suite cabin was literally twice the size of the balcony cabin on the Meragivilia, so there is no competition there. Having the personal butler was also superior, to having a room steward who did not turn up on two days because he was assigned to 1) cleaning the balconies; and 2) crew safety drills. On the plus side we booked cabin 8205 which sits just above the lifecraft and has a balcony 2.5 times the size of the other balcony cabins. We enjoyed the extra space there. I have covered above. The specialty restaurants on the Meravilia were all a bit hit and miss. Butcher&apos;s Cut was very good, but sitting in the Galleria walkway is not good if you don&apos;t want people standing next to your table and yelling to their friends on the deck below. The Sushi was very high quality but light in quantity and the desert was not available. The Eataly was better than the reviews suggest, with SOME of the dishes being very good, but that was again let down by the deserts being very ordinary. On average the food was better on the Meraviglia, but the dining experience was better on the Luminosa because of the full time use of the Club Luminosa. Activities on the Meraviglia surpassed those on the Luminosa although we enjoyed our included spa day on the Luminosa very much. The Meraviglia is a bigger ship and just has slightly more on offer, more bars, galleria, and water slides. We found the shows to be quite even on balance. The Luminosa shows were very good. The entertainers around the ship were somewhat limited. We enjoyed playing a game where we would work out what lyrics the singers were actually singing when they sang English songs. What they actually sang guessing at the English and pronunciation was actually quite hilarious. Trivial Pursuit had a dimension added to it when presented by someone who clearly did not know how to translate questions into English. "What color does a bride in China wear?" became "What color is the bridge in cheena?" We did not do well. On the Meraviglia three of the four shows we went to appeared to be lip-synced. Now I stand to be corrected, but it appeared to us that in all but the show including the band the singers lip-synced their way through the entire show. The dancers on the Luminosa were less ballet trained but worked as a troupe much better. The Circ-de-sole show was excellent on the Meraviglia so the shows came out even for me. Staff and service was excellent on both cruises. Staff were always friendly, pleasant and eager to help when help was asked. We did not run into attitude or passing the buck on either ship. The staff were great. We only did one excursion in the two cruises and might well have avoided that with what we know in hindsight. 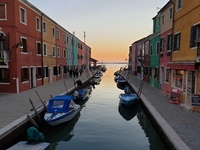 Most excursions can be duplicated with a significant cost savings with a little self planning. Ports really depend on the individual and where you want to go. You should want to go to Venice though. :-) Only one comment on excursions: none of the excursions offered on Meraviglia would take you inside La Sagrada Familia in Barcelona. This is a crime. You should not go to Barcelona and not go inside this unique and stunningly beautiful building. The outside is impressive, but the inside is a moving experience. Costa Luminosa won me over as the best value for money. The big Meraviglia was just too crowed and noisy for me. The public spaces were always filled with the din of loud conversation and no matter what time of night it always seemed from the cabin someone was slamming a door somewhere or children were running up and down the halls. My advice is, give Costa another look, but book the suite or better. 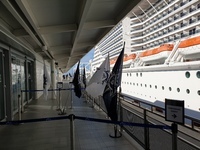 I didn&apos;t book the MSC Yacht Club experience, but I have read that children rule the roost there as well, so that might not be your best solution and is pricey. Good luck everyone and I hope you have a great next cruise.